The Arctic has been an area of great global interest for oil and gas development. However, offshore oil and gas activities in the Arctic present risks to marine mammals and to the Alaska Native communities that depend on them for subsistence and cultural purposes. Those risks come from, among other things, sound generated by seismic surveys, drilling operations, and vessel and aircraft support activities; contamination from drilling and oil spills; and disruption of bottom habitats from temporary or permanent mooring or pipe-laying activities. The greatest risk to marine mammals and the marine environment is from oil spills, whether from drilling or ship-related accidents. The Deepwater Horizon oil spill highlighted the difficulties of responding to and cleaning up a major spill. Those challenges are heightened by the Arctic’s remoteness, harsh conditions, and lack of infrastructure, trained personnel, and response equipment. Exploration and development of offshore oil and gas reserves in the Arctic and elsewhere pose considerable practical challenges and bring risks to marine ecosystems. The Marine Mammal Commission’s 2012 annual report provides a history of offshore oil and gas development in the Arctic, impacts to marine mammals and on the availability of marine mammals for subsistence, and developments in oil spill response technology. The following summarizes that information as well as current efforts to explore and develop oil and gas resources and to plan for spill response in the U.S. Arctic. The Commission regularly reviews and comments on the Bureau of Ocean Energy Management’s (BOEM) proposed oil and gas activities in the Arctic, including lease sales, and on proposed Marine Mammal Protection Act (MMPA) incidental take authorizations issued by the National Marine Fisheries Service (NMFS) and the U.S. Fish and Wildlife Service (FWS). We also comment on and promote environmental studies to better understand the potential effects of oil and gas activities on Arctic marine mammals, and facilitate efforts to identify and address priority information needs through convening of workshops and meetings. The Commission has commented specifically on the need for better information on the long-term and cumulative effects of oil and gas exploration, particularly exposure to sound from seismic surveys, drilling, and other activities; on whether bowhead whales and other marine mammals are showing signs of habituation to sound; and whether animals are altering migration routes and foraging patterns to avoid exposure to sound. Also needed is the incorporation of traditional/indigenous knowledge into agency decision-making processes. 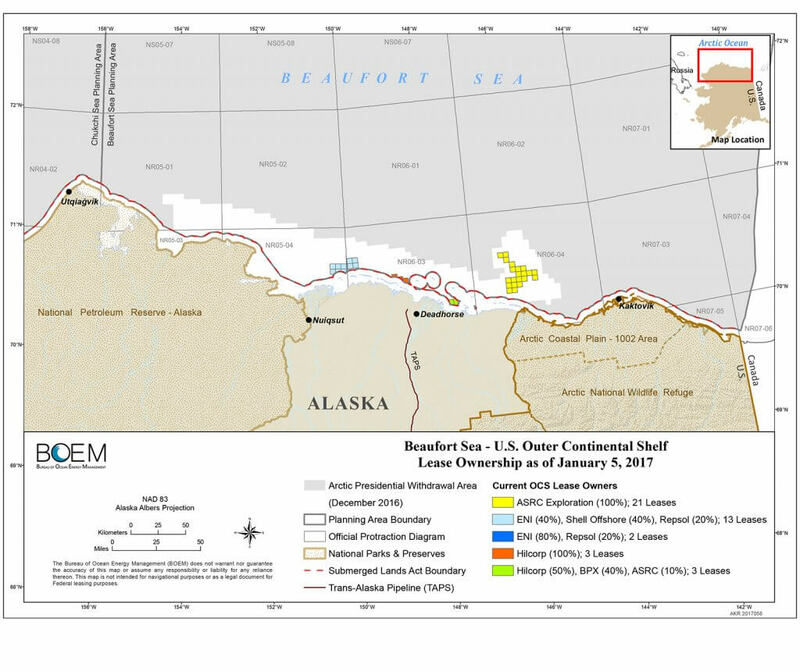 BOEM’s 2012-2017 five-year leasing program had two lease sales scheduled in the U.S. Arctic—one in the Chukchi Sea in 2016 and one in the Beaufort Sea in 2017. The Commission submitted comments to BOEM on each of the two proposed lease sales (see letters section below). In October 2015, the Department of the Interior cancelled both lease sales citing market conditions and low industry interest. In January 2015, President Barack Obama withdrew large portions of the Chukchi and Beaufort Seas from new offshore oil and gas drilling, under authority of Section 12(a) of the Outer Continental Shelf Lands Act. In December 2016, the President expanded the previous withdrawal to include nearly all of the Chukchi and Beaufort Sea planning areas. The 2017-2022 leasing program was approved in January 2017 and does not include lease sales in the Arctic, consistent with President Obama’s directive. In April 2017, President Donald Trump issued an Executive Order directing the Secretary of the Interior to consider revising the schedule of oil and gas lease sales for 2017-2022 to include those areas within the Beaufort and Chukchi Sea that had been previously withdrawn from leasing, among other things. BOEM is now in the process of developing a new five-year National OCS oil and gas leasing program for 2019-2024. More information regarding oil and gas leasing on the U.S. Outer Continental Shelf, as well as links to relevant Commission comment letters, can be found on the Commission’s Oil and Gas Development and Marine Mammals webpage. Oil and gas exploration activities in the Arctic substantially increased in the early 2000’s. Interest was spurred in part by estimates of significant reserves in offshore waters of the U.S. Arctic Outer Continental Shelf (OCS). BOEM estimates of undiscovered technically recoverable resources of oil and gas in the Arctic underscore the significance of the U.S. Arctic for potential oil and gas development, with almost 29 percent of the total U.S. potential offshore oil and gas resources contained in Arctic planning areas (20 percent in the Chukchi Sea and 9 percent in the Beaufort Sea). Exploration activities in the Chukchi and Beaufort Seas since the most recent Arctic lease sale in 2008 have included seismic surveys, shallow hazards site surveys, and limited exploratory drilling. In 2012, Shell attempted to drill exploratory wells in both the Chukchi and Beaufort Seas, but was unsuccessful. (A more detailed summary of Shell’s 2012 drilling activities can be found in the Commission’s 2012 annual report). In 2015, Shell drilled an exploratory well in the Chukchi Sea but failed to find any meaningful quantities of oil or natural gas. Shell subsequently announced that it would halt exploration efforts in the Arctic. All remaining leases in the Chukchi Sea have since been relinquished by Shell and others. In July 2017, BOEM approved plans for Eni US Operating Co. Inc. to conduct exploratory drilling in federal waters from its Spy Island drill site, an existing man-made island in Alaska state waters. The drill site is north of the Nikaitchuq oil field, about three miles off Oliktok Point, in the Beaufort Sea. In April 2018, BOEM approved a revision to Eni’s exploration plan that allowed for drilling in Summer 2018 and reduced the number of wells that could be drilled. Production drilling in U.S. Arctic federal waters is currently limited to the Northstar facility in the Beaufort Sea, which began producing in 2001. Northstar is a joint federal/state of Alaska project originally operated by BP Exploration Alaska Inc., but now operated by Hilcorp Alaska LLC. It is located about 12 miles northwest of Prudhoe Bay. A new offshore production facility is being planned at Hilcorp Alaska LLC’s Liberty oil field, also in the Beaufort Sea. BOEM finalized its Environmental Impact Statement (EIS) analyzing the potential impacts of Liberty’s Development and Production Plan in August 2018. The Final EIS includes NMFS’s statewide emergency response standards for marine mammals. Production facilities operating currently in Alaska state waters of the Beaufort Sea include Endicott Island and Oooguruk Island. In July 2016, the Bureau of Safety and Environmental Enforcement (BSEE) issued a final rule governing exploratory drilling activities on the U.S. Arctic Outer Continental Shelf. The regulations are intended to ensure that exploratory drilling activities in the Arctic Ocean are conducted in a safe and responsible manner, while protecting marine, coastal, and human environments, and Alaska Natives’ cultural traditions and access to subsistence resources. Seismic surveys and drilling activities have the potential to harm marine mammals. Learn more about stages of oil and gas development and potential impacts to marine mammals. At the Commission’s 2012 annual meeting in Anchorage, Alaska, Native hunters noted the extreme sensitivity of marine mammals to sound and vessel activities, and how underwater sound has been increasing over the last 30 years. Increased sound levels could cause marine mammals to leave traditional hunting areas. The hunters also raised concerns that the whales and seals that they eat may become contaminated by exposure to drilling muds or oil, either directly or through consumption of contaminated prey. Additionally, they expressed doubt that current oil spill response techniques would be effective at removing oil before animals became exposed. Whalers in Barrow, Alaska, and other Arctic communities who are members of the Alaska Eskimo Whaling Commission have jointly entered into annual “Conflict Avoidance Agreements (CAA)” with oil and gas companies and seismic operators to minimize disturbance of the spring and fall bowhead whale subsistence hunts. The agreements specify areas and times that industry must not operate so as to avoid disturbing marine mammals before a hunt. The agreements also require the use of village-based communication centers to relay information between hunters and industry regarding planned operations and marine mammal presence and movements. The hunters have recommended that future agreements be expanded to include other species besides bowhead whales and also to address other potentially harmful activities, such as shipping and fishing. They noted the agreements must also be enforceable by the federal government. NMFS regulations require that applicants for incidental harassment authorizations prepare a Plan of Cooperation (POC) that identifies measures that have or will be taken to minimize adverse effects on the availability of marine mammals for subsistence purposes. Although POCs are not structured as “consensus” agreements (as are CAAs), they are enforceable. The National Research Council’s report, Responding to Oil Spills in the U.S. Arctic Marine Environment, highlighted the lack of adequate oil spill response tools, capabilities, and infrastructure for any large spill that might occur in the U.S. Arctic. The report, sponsored in part by the Commission, called for testing of current and emerging technologies in realistic conditions, using carefully controlled field experiments. The report recommended the use of a rigorous decision process, such as the Net Environmental Benefits Analysis, to evaluate different response options and associated environmental impacts that may result. Response options identified for the Arctic include biodegradation, chemical dispersants, oil herding agents, in situ burning, and mechanical containment and recovery (learn more about potential impacts of response activities on marine mammals); however, additional research is needed to inform decision-making regarding response options under various scenarios. The severe shortage of housing, fresh water, food, sewage handling and garbage removal facilities, communications infrastructure, supplies, and hospitals and medical support were cited as a major limitation in launching an effective response effort in the Arctic. The report noted that better communication and planning is needed among the various federal and state agencies that would be involved in oil spill response and with international partners, such as Canada and Russia. Also needed is oil spill training for local communities and integration of local traditional knowledge of ice and ocean conditions and marine life to enhance the effectiveness of oil spill response. The Bureau of Safety and Environmental Enforcement (BSEE) has increased efforts to conduct oil spill response research after the Deepwater Horizon oil spill, and has funded efforts to expand research on response equipment and methods in icy conditions, such as the effectiveness of dispersants in ice, in situ burning in ice conditions, and remote sensing of oil in and under ice. BSEE has also finalized drilling regulations for the Arctic to prevent an oil spill, and is developing stronger analytical capabilities to model spill trajectories and worst case discharge scenarios and to conduct training and drills in the event of a spill. The oil and gas industry also has significant responsibilities to enhance oil spill response capabilities in Arctic conditions. Currently, the majority of resources and trained personnel for oil spill response in the Arctic are located in the Beaufort Sea, near Prudhoe Bay. However, additional capabilities are under development on the Northwest Coast of Alaska, along the Chukchi Sea coast. 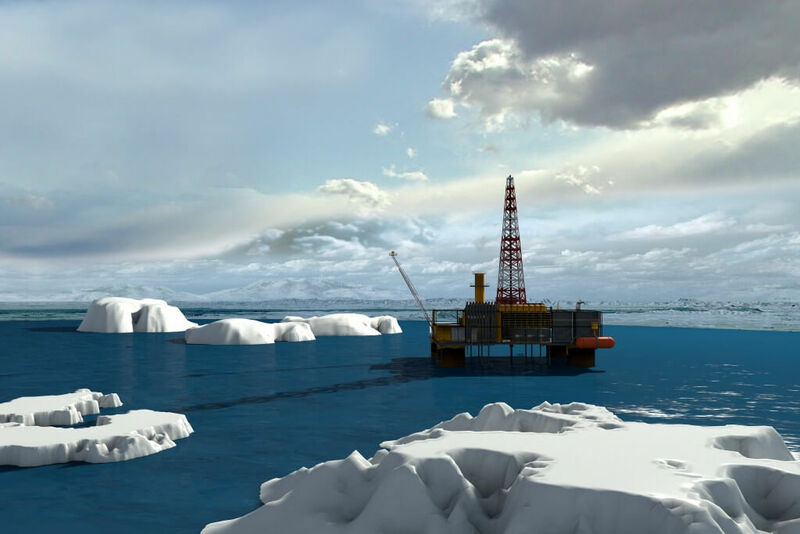 A number of international oil and gas companies have launched a collaborative effort to enhance Arctic oil and gas capabilities globally as part of the Arctic Oil Spill Response Technology Joint Industry Programme. In 2013 the Arctic Council Working Group on Emergency Prevention Preparedness and Response developed an Agreement on Cooperation on Marine Oil Pollution, Preparedness and Response in the Arctic. The voluntary agreement, signed by the United States and several other Arctic nations, is intended to strengthen cooperation, coordination, and mutual assistance among the signatories on oil pollution preparedness and response in the Arctic. Recognizing that oil spill prevention and avoidance of maritime accidents are much more cost-effective than oil spill response and clean-up, the non-profit Marine Exchange of Alaska (MXAK) has developed an expansive vessel tracking system in Alaska with over 125 Automatic Identification System (AIS) receiving stations to aid safe, secure, efficient and environmentally sound maritime operations. 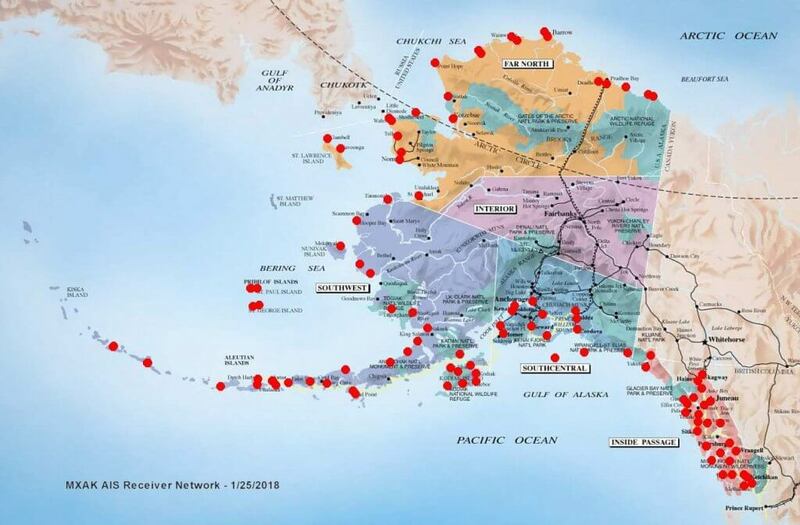 Vessel owners, operators, ports, the Coast Guard, the State of Alaska and other authorized users may view vessels’ locations via MXAK’s secure system. MXAK staff track vessel movements to provide valuable safety, navigational and logistics information to the maritime community and to provide a virtual “Safety Net” that also contributes to the efficiency of maritime operations. Responsibility for responding to Arctic marine mammals in the event of a spill would fall primarily to the federal and state resource agencies. At the federal level, FWS is responsible for protection of polar bears and walruses and NMFS is responsible for protection of all other Arctic marine mammals. The Alaska Department of Fish and Game has a mandate to manage and protect all wildlife resources and has joint statutory responsibilities with NMFS and FWS. Each agency has pre-determined roles and responsibilities in the event of an oil spill, as outlined in the Wildlife Protection Guidelines of the recently updated Alaska Regional and Area Contingency Plans. There are three levels of wildlife-protection response strategies identified in the Wildlife Protection Guidelines: primary, secondary, and tertiary. Primary response involves preventing oil from contaminating animals and their habitats, which may require skimming, booming, in situ burning, and/or the use of dispersants, as well the removal of oiled debris and food sources (including oiled carcasses). Secondary response, which would be considerably more challenging, involves preventing animals from entering oiled areas through the use of hazing or deterrence methods. 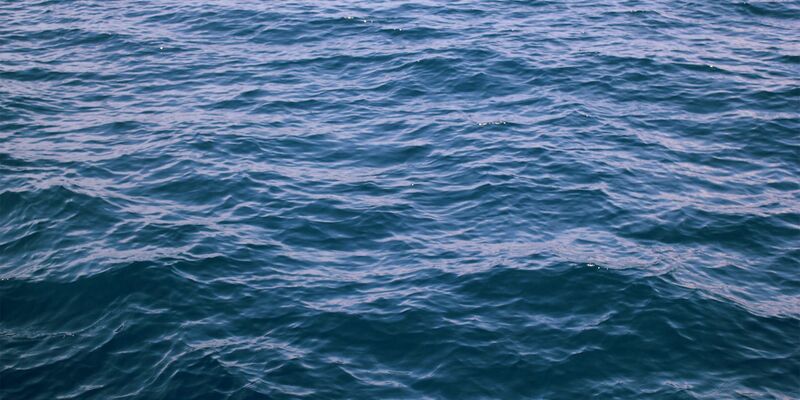 Hazing methods could include the use of acoustic deterrents, metal pipes that are banged against the side of a vessel, boat-based herding, or the use of fire hoses to keep animals away from oiled areas. Secondary response may also involve pre-emptive capture and release of animals into an unaffected area. Tertiary response, considered only as a last resort, involves capture, treatment, rehabilitation, and release of oiled animals. Secondary and tertiary response methods would require specific authorization under the MMPA (and Endangered Species Act for listed species), training of designated responders, specialized care by veterinarians, and appropriately-equipped rehabilitation facilities. Partly in response to the 1989 Exxon Valdez oil spill both FWS and NMFS have developed marine mammal-specific oil spill response guidelines, and have conducted training, workshops, and drills for their designated marine mammal stranding response organizations and veterinarians. The FWS has developed an oil spill response plan for polar bears; a similar plan is being developed for walruses. The plans provide information on population(s), distribution, life history, susceptibility to oil spills, responder training needs, response strategies, and key contacts. NMFS’s recently updated Pinniped and Cetacean Oil Spill Response Guidelines provides information and guidance on communications with other responders and the public, documentation of injuries (including sample data collection forms), care and rehabilitation of oiled animals, and making informed decisions for appropriate response during an oil spill event. NMFS has also finalized its Arctic Marine Mammal Disaster Response Guidelines. The Guidelines pertain specifically to Arctic marine mammals under NMFS jurisdiction (whales and seals) and are intended to supplement existing guidance in the Alaska Area Contingency Plans and the NMFS Pinniped and Cetacean Oil Spill Response Guidelines. The Commission submitted comments on the draft Guidelines in 2017 (see letters section below). Letter to BOEM with comments on Notice of Intent to Prepare an Environmental Impact Statement for the Proposed Oil and Gas Lease Sale in the Beaufort Sea Outer Continental Shelf Planning Area.